Easter Island is a Polynesian island in the southeastern Pacific Ocean, at the southeastern most point of the Polynesian triangle. A special territory of Chile annexed in 1888, Easter Island is widely famous for its monumental statues, called moai, created by the Rapanui people. 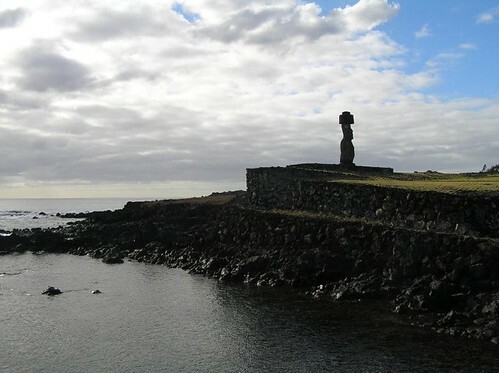 It is a world heritage site with much of the island protected within the Rapa Nui National Park. The early history involves human settlement roughly one millennium before present. Subsequent human overpopulation and resultant deforestation led to collapse of the human society.Archaeological evidence of the earlier habitation consists of the moai themselves as well as the pollen and fossil records. Through these records, scientists have come to understand the role of a now extinct Rapa Nui Palm, which offered food, fuel and transport for the early settlers. Chile first declared the island a National Park in 1935, and on 22 March 1996 UNESCO designated the island a World Heritage Site. Park boundaries have since varied on several occasions, to return land to the islanders.